A navigation mesh is a navigation area which is arranged above the surface of the arbitrary mesh. In fact, the navigation mesh is the area of the specified height above the mesh polygons, which is available for pathfinding. Only 2D routes can be calculated within the navigation mesh. Within several intersecting navigation meshes. Within the intersecting navigation mesh and sector. Any polygon of the mesh must not share its edge with more than 2 other polygons; otherwise, an error will occur. Mesh polygons should be as wide as possible (ideally, they should be equilateral). Too narrow and high polygons may reduce accuracy of path calculation. The mesh should be optimized: it should not contain a large number of polygons. 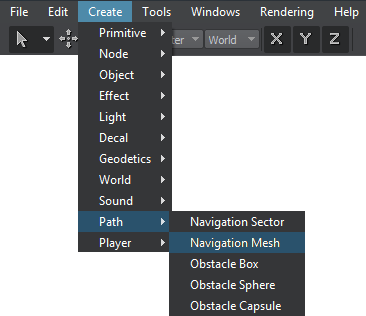 On the Menu bar, click Create -> Path -> Navigation Mesh. 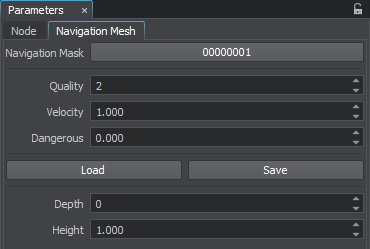 In the file dialog window that opens, choose the required mesh to be used as a base for the new navigation area and click Ok.
Click somewhere in the world to place the navigation mesh. 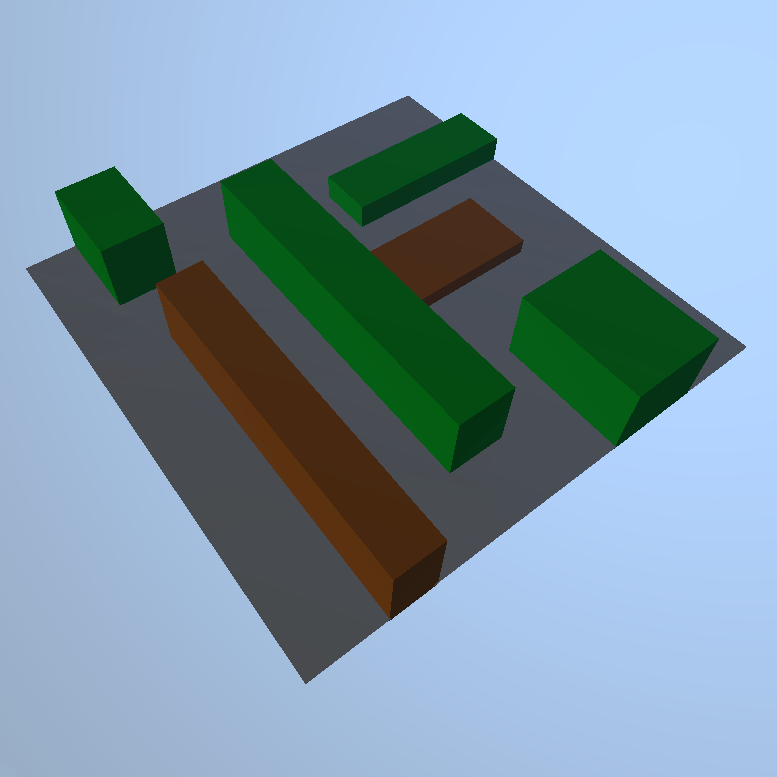 The new navigation mesh will be added to UnigineEditor and you will be able to edit it via the Parameters window. The created navigation mesh only provides an area within which the 2D routes are calculated. The routes themselves should be created from the script. Create a flat mesh with holes in places where the objects are positioned. Place the navigation mesh above the scene. In this case, you can also use a navigation sector with obstacles positioned inside it instead of the navigation mesh. However, the navigation mesh is preferred for more complex cases. Navigation mask. The navigation mask of the navigation mesh must match the navigation mask of the route that is calculated within it. 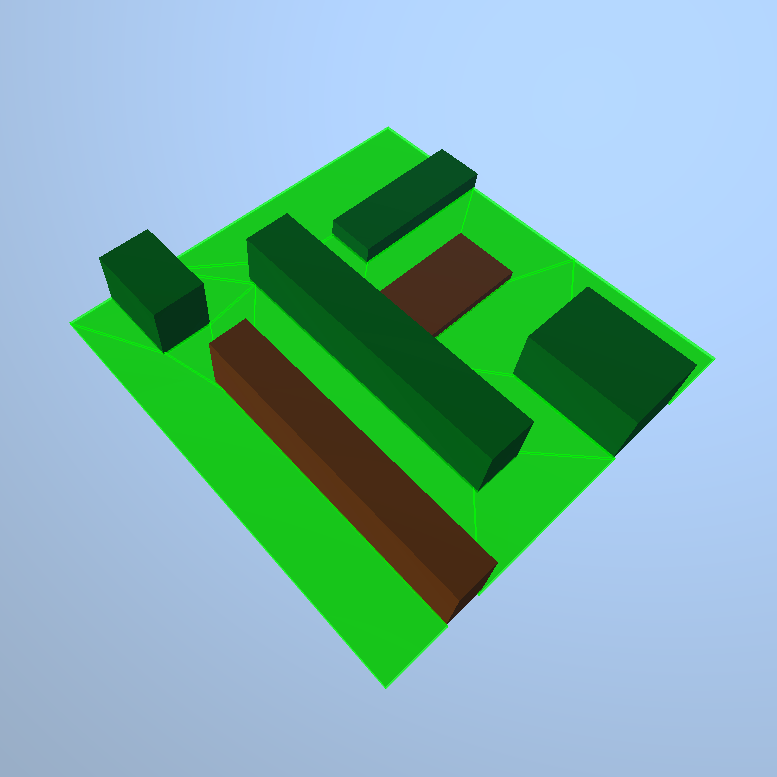 Otherwise, the navigation mesh will not participate in pathfinding. Quality of optimization of the route that has already been calculated. This value specifies the number of iterations that are used for taking the short cut. The higher the value, the longer the route calculation will take. Scaling factor for velocity of the point that moves inside the navigation mesh. Danger factor that indicates if the moving point should try to avoid the navigation mesh. If the danger factor exceeds the maximum danger factor set for the route, the navigation mesh will be excluded from pathfinding calculations. Depth value. This value affects the quality of the route that is currently calculated. The larger the depth value, the better control over accuracy and speed of route calculation is provided. The depth can take integer value in range [0;4]. 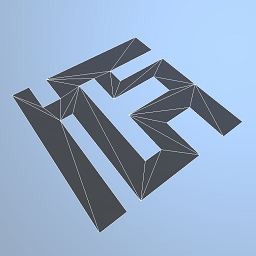 By default, the depth is set to 0 for a new navigation mesh. The 2, 3, 4 values are used for deeper heuristics. 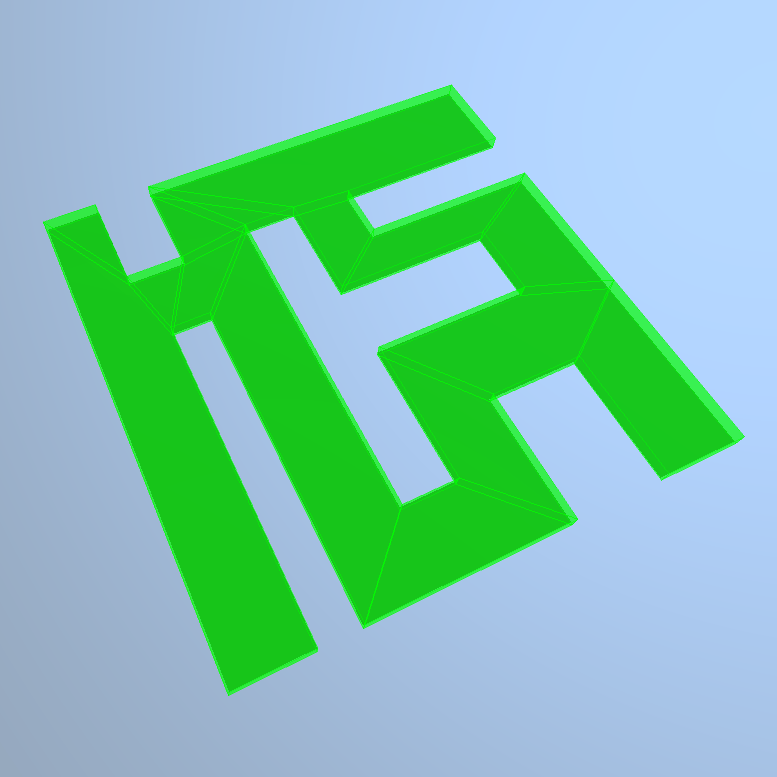 Distance above the mesh polygons available for pathfinding. By default, the height is set to 1 for a new navigation mesh. On the Navigation tab, press . 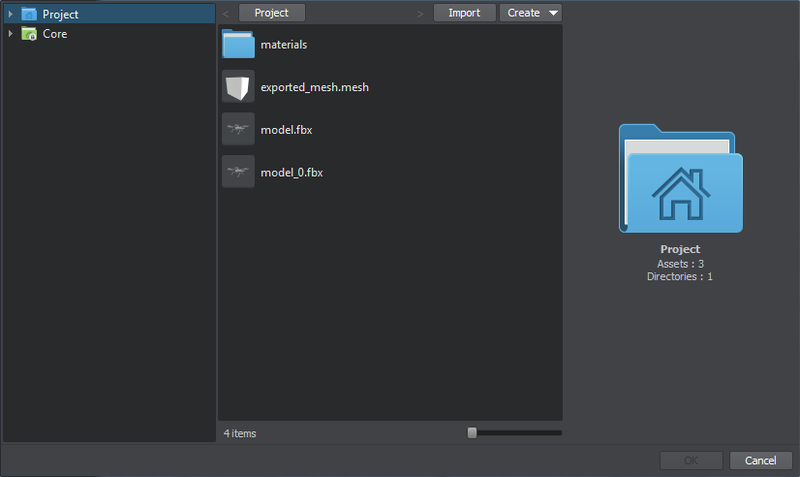 In the file dialog window that opens, choose the required mesh and press Ok. In the file dialog window that opens, specify a name for the mesh and press Ok.